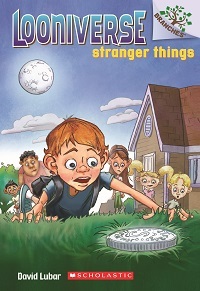 Stranger Things is the first book in my new early chapter-book series, Looniverse. When Ed finds a magic coin, his whole world turns stranger and stranger. His brother makes saying come true, his sister brings fairy tales to life, and his friend lifts himself up in the air. Ed has to figure out how to take control of the strangeness before the world changes forever.